The Weather-Out pool heater cover features a high-quality durable vinyl exterior that resists tears and damage from sunlight while protecting the heater from rain, salt-water spray, sprinkler systems, ice, snow, leaves, and other debris. The non-woven interior lining does not retain moisture and prevents condensation. Add to that the generous fit of the cover, which allows plenty of air flow, and the result is a clean, dry heater! A Velcro seam allows easy installation and removal -- the cover fits nicely around the water heater plumbing without having to disconnect or remove any piping whatsoever. 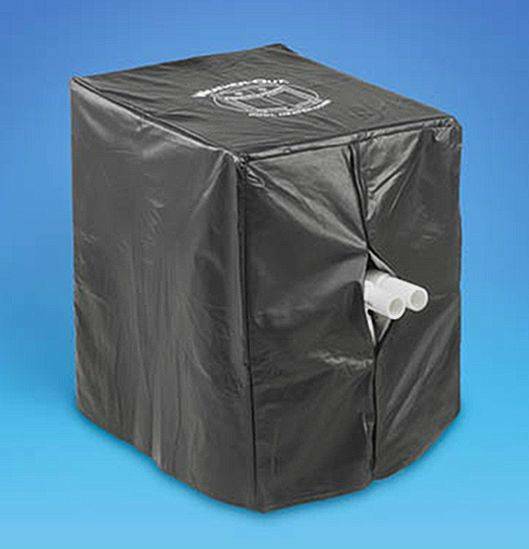 Weather-Out manufactures high quality pool heater covers that protect your expensive equipment from damaging and efficiency-hampering debris. During the fall and early spring, trees shed an abundance of leaves, twigs, seeds, and pine needles which lay inside of your pool heater and trap moisture. In the winter rain, snow, and ice accumulate in, on, and around your heater. During these times of the year, when problems are at their peak, your heater will be properly covered and protected. If you live in a warmer locale, your heater should be covered during any period of extended non-use, and be sure to cover your heater to protect it from sprinkler systems and salt-water spray.